Last week, I walked into a hug. And, it came with a latte. It was Opening Day at Sap Bush Hollow Cafe. Shannon Hayes and her family built a new enterprise to complement their farm business, and they decided on building their community as well. With sweat, tears, and bucketloads of hard work, they created a place for people in their small town to gather, enjoy delicious (and nutritious!) fare, and be able to access high-speed internet. All these things are a rarity in West Fulton, but all three were welcomed with great cheer on a rainy Saturday in July. Um, yes. But it’s not simple. Shannon went on to explain that they see so many folks farming and asking their communities to support their family farms. She and her family turned that request on its head. What could they, with their small family farm, do to support their community? Their answer: Build a place for community members to sit, eat, and enjoy each others company, bring in high-speed internet, showcase talents in future gallery showings on the warm red walls. The cafe has heart and soul. 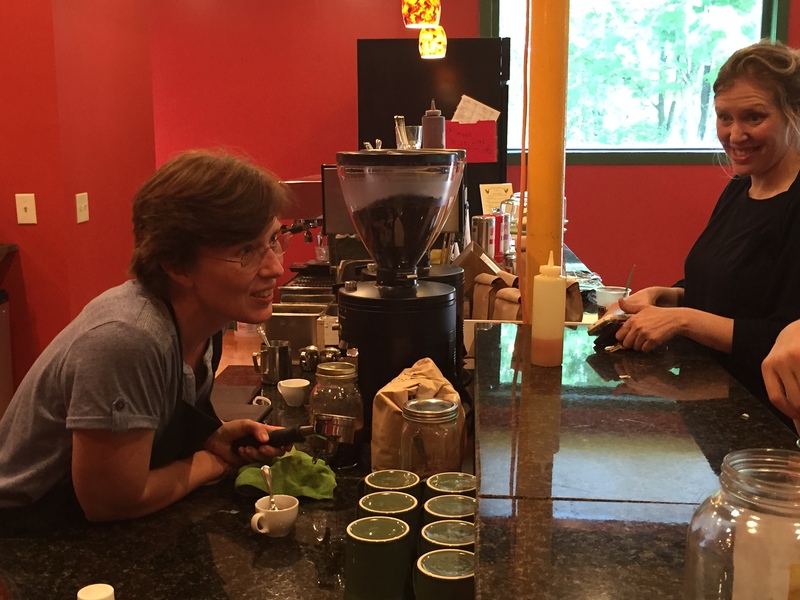 The space was filled with smiling people enjoying coffee, farm-raised fare, and conversation. John, sitting next to me, noted that the weekend’s puppet festival and this cafe were the two highlights he had seen in 35 years in the community. The past couple of weeks, we’ve been talking about suffering and farming here at On Pasture. How do you put the hard, hard work of farming into perspective? Shannon started the conversation with this piece. Your perspectives have added ever more depth to the conversation. What we can see though, is that the only thing we can control in this life is our own perspective. By switching the way she looked at what they need to survive and thrive, Shannon built a perspective that feeds the present and the future. This cafe may help West Fulton, and it is poised to help her family farm support the next generation. Focusing on the solution, on what you want your world to look like, feels like a hug and the best latte you can imagine. Thanks, Shannon, for the nourishment. How do you nourish your community? We’d love to hear! The more heads the better! The cafe is at 832 Fulton Rd, in West Fulton, NY. It’s open on weekends, and serves amazingly delicious coffee, gluten-free baked goods, and farm-produced fare, including 2-year-old egg salad. Shannon has been a HUGE On Pasture Supporter, donating books to folks who send us support of $50 or more. So if you’re in the area, stop by and say thanks. Is Corn Sweat to Blame for the Heat Wave? 1. Volunteer at the seniors’ home (I do music). 2. Learn people’s names (children, too, and esp. older people) and greet them. I use a white board covered with names to help me remember; I’m 67.